Metrodata is pleased to announce the forthcoming release of a new member of the MetroCONNECT 'Ethernet Demarcation Device' (EDD) family, the FCM10G05, for use with 10Gbps Network Services. Building on the success of the existing EDD line-up, including both FCM9003 Ethernet Access Device and FCM9005 Ethernet Demarcation Device products for 1Gbps operation, the FCM10G05 offers rich functionality at an attractive price-point for Telecoms Carriers and Ethernet Service Providers seeking full end-to-end performance visibility and service management on behalf of their customers. The FCM10G05 supports a similar feature-set to other members of the MetroCONNECT FCM900x series of EDDs, including advanced Circuit Activation Testing and in-service performance monitoring, interfaced via SFP+ flexible-media ports. RFC2544 and Y.1564 test methodologies, supporting both Ethernet and IP addressing, facilitate detailed performance characterisation of both Switched Ethernet and IP-Routed WAN topologies. Furthermore, through support of both ITU-T Y.1731 and 'Two-Way Active Measurement Protocol' (TWAMP), the FCM10G05 offers highly precise in-service performance monitoring across both Switched and IP-Routed infrastructure networks. Both of these functions are enabled via Metrodata's unique 'MetroSAM' (Service Assurance Module) hardware, which also performs wire-rate address-swapping loop-back for both Ethernet MAC and IP addressed packets, enabling the FCM10G05 to be used as a reflector point for both MetroCONNECT and third-party test equipment. Regular Demarcation functions, such as 'Dying Gasp' power loss alarming, VLAN traffic/service segregation (including Q-in-Q), prioritisation and policing, are fully supported, along with comprehensive 'tunnelling' for Layer-2 Control Protocols (L2CP), to ensure full transparency to Customers' critical network control traffic, across the Carrier infrastructure. 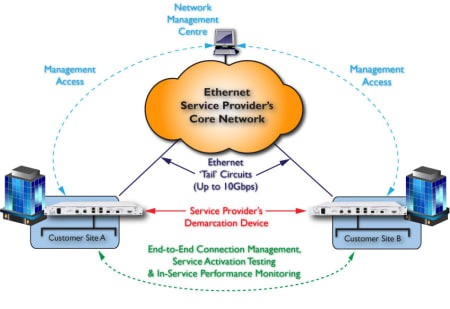 Comprehensive Network Management options are provided, including Local Terminal connection or in-band via Carrier Ethernet OAM, SNMP, Telnet/SSH or Web Browser interface, with support for TACACS+ User Authentication where required. Click for more detailed information on the FCM10G05, or contact our sales team.